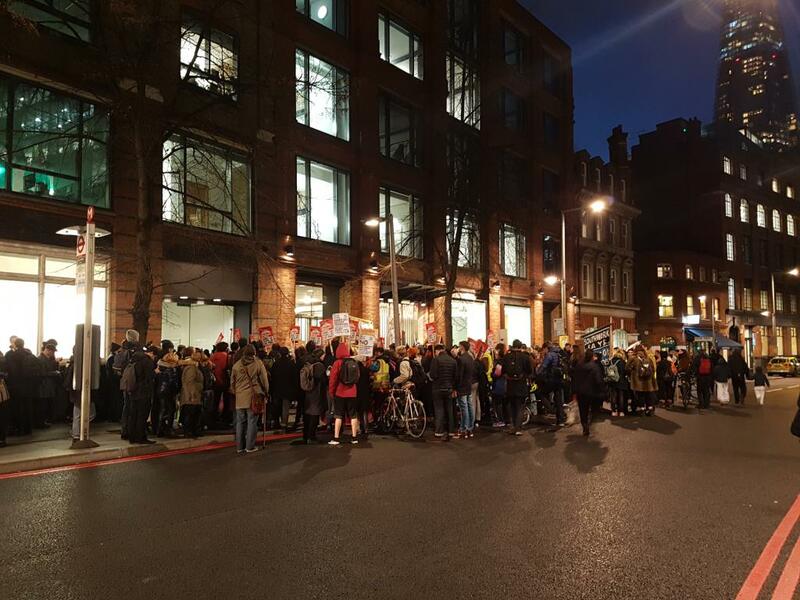 Local residents - many from the area's Latin American community - and students, marched from the London College of Communication's (LCC) campus off the Elephant roundabout to the council offices on Tooley Street. As the march snaked through South London, protesters chanted demands for social housing - in a borough with a notoriously poor track record of providing it. Outside the Council offices, protesters listened to impassioned speeches before the chant of "let us in" went up. Security gates blocking access to the foyer sprang open and the crowd rushed in to the foyer of the council building. Demonstrators had to be held back by security guards as meetings on the ground floor were evacuated. As the protest continued inside the council offices, music was played and the crowd made space for some Latin dancing. The next track on was Skepta's Shutdown, reflecting the feeling that the planning committee meeting had been successfully disrupted - although that wasn't the case. The threatened demolition of the Elephant and Castle shopping centre in South London has loomed over the space for over a decade. Those familiar with the area will be all too aware of the destruction of social housing on the nearby Heygate Estate, where over 1,200 homes have already been demolished by the local council, as well as the ongoing destruction of the nearby Aylesbury Estate and many of the other programs of estate “regeneration” taking place across the area. Last night, Southwark Council’s planning committee met to discuss the proposed redevelopment of the shopping centre by Delancey (the objections to this redevelopment are covered in far more detail here). The proposals would see the shopping centre and LCC's campus demolished, to be replaced by a new development resituating the two alongside a new housing development featuring a staggeringly low 33 “affordable” homes out of the 979 promised. 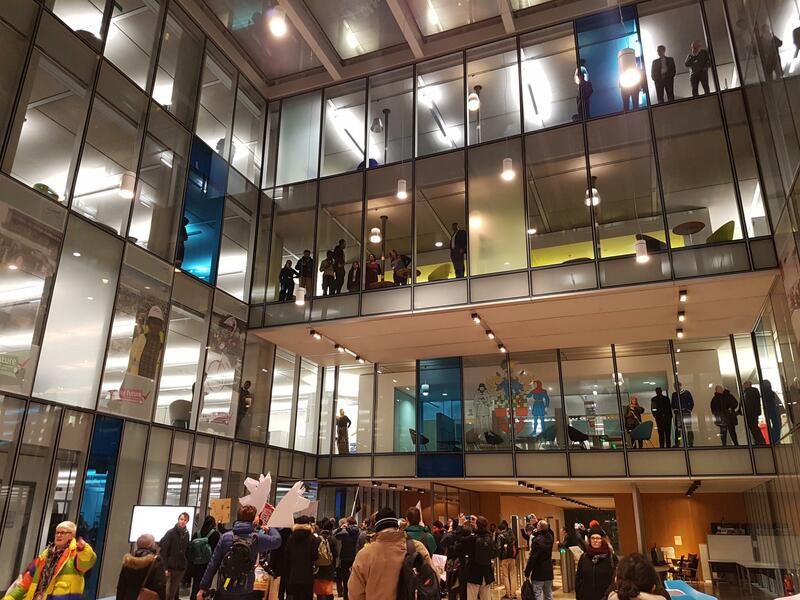 Objections to these proposals have been raised and submitted by many: from tenants of the shops affected and users of the centre, to students at the LCC, local campaigning groups, and increasingly, councillors from Southwark Council itself. One planning committee meeting was already cancelled late last year in response to the growing volume of objections to the proposed redevelopment. It was against this backdrop that a number of groups called for a demonstration to support those raising objections to the proposals at Tuesday’s committee meeting. Those present at Tuesday's demonstration talked of the importance of the shopping centre as it exists now as a vital resource for those who live in the area. Others drew parallels to the similarly threatened Latin American market in Haringey, which similarly offers an essential base for the people living there. The demo represented everything that's great about Elephant because it was led by migrants, students and community groups. It's good news that the application was rejected but the council's main concern seems to be the process, rather than the principle, of social cleansing. We will need to stay active in our communities and keep a close eye on Southwark to stop the continuing destruction of Elephant & Castle.